Looking for an excuse to go ride your bike that has been parked on your patio for two months? Or how about a good reason to stop in for snacks and cocktails at five Tampa restaurants? Well during the Urban Restaurant Tour you can have it all. 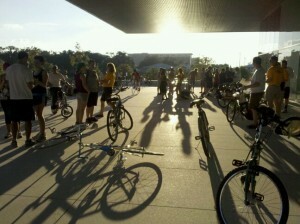 The monthly bike tour, held on the last Thursday of the month and hosted by City Bike Tampa – a locally owned and operated specialty bicycle shop, is a guided bike ride that begins and ends in downtown and stops at five participating restaurants for free samples, specials and complimentary appetizers along the way. Last month’s event had over 120 riders so it is recommended that planned participants register ASAP (Click here for registration information. Or call 813-225-1777. The ride commences with a raffle drawing for prizes at the final destination. Do you really need more of a reason than this to eat and exercise and explore? Click here for more information on Urban Restaurant Tour.